Scores of Palestinians and Israeli soldiers have been killed on Sunday as hostilities continue in the Gaza strip. Both sides earlier agreed to a brief ceasefire to allow medics to reach those wounded by Israeli shells. At least 87 Palestinians were killed on Sunday, according to the Palestinian Health Ministry, as the Israeli Defense Forces shelled the Shejaia district in the north east of Gaza. The casualties are the heaviest since Israel launched its offensive on the Palestinian territory on July 8. Harry Fear, an RT contributor who is in Gaza summed up the scene this afternoon. 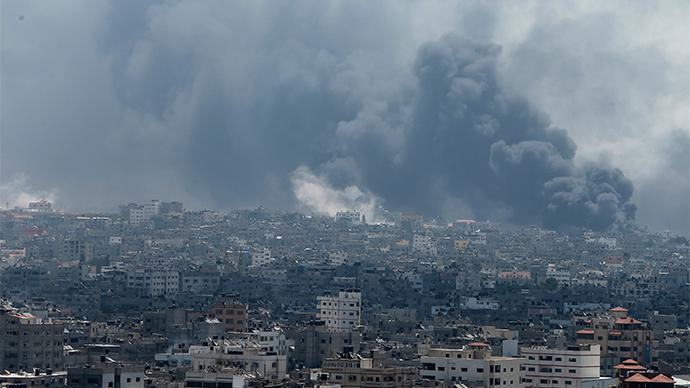 “For approximately one hour this afternoon, Israel held fire on the Shejaia neighborhood in east Gaza. Just over the last few minutes, Israel has continued to fire on this neighborhood, which has been heavily pounded this morning and last night,” he said. Both Hamas and Israel agreeded to a brief ceasefire earlier in the day, which was broken after just an hour after shots were fired in Gaza. “The agreement to implement a ceasefire was ended because of Hamas who started shooting at our soldiers. We had to answer back,” said an Israeli army source. Hamas is yet to comment on Israeli allegations that it had breached the ceasefire. The death toll was condemned by the Arab League who described Israeli attacks on Gaza on Sunday as a “war crime” against Palestinian civilians. Over 400 Palestinians have been killed in Israel’s operation Protective Edge, the Palestinian Ministry of Health said on Sunday. 13 Israeli soldiers were killed on Saturday night and early Sunday in several incidents across the Gaza strip, bringing the total number of fatilites in less than two days, according to Haaretz. Since last night, 13 soldiers from the IDF's Golani Brigade were killed while fighting Hamas terrorists in Gaza. During the ceasefire, local Gaza rescue services managed to evacuate 50 Palestinian bodies from the Shejaia neighborhood in the east of Gaza City. The Gaza Health Ministry says the dead included 17 children and 14 women and hundreds of wounded were being treated. The Rafah crossing has been opened, but only for use for humanitarian emergencies. The ceasefire, requested by the International Committee of the Red Cross, was due to last from 1:30pm to 3:30pm (10:30-12:30 GMT) in the Shejaia district. According to Haaretz, the Israeli Defense Forces also announced they will set up a field hospital near the Erez Crossing at the northern end of the Gaza strip, to treat wounded Palestinians. Israeli Prime Minister Benjamin Netanyahu said on Sunday that Israel will take "whatever action is necessary" to halt Hamas cross-border rocket attacks from Gaza and restore calm but insisted his forces were doing their utmost to avoid civilian casualties there. "We try to target military targets and unfortunately there are civilian casualties which we regret and we don't seek," Netanyahu told CNN shortly after an Israeli attack on a Gaza neighborhood killed at least 89 Palestinians. He accused Hamas of deliberately targeting Israeli civilians and of using Gaza residents as "human shields." Asked how long it would take Israel to complete an operation it says is intended to destroy Hamas weapons tunnels, Netanyahu said it was being done "fairly quickly," but gave no time frame. Doha has announced it will host a meeting between Palestinian President Mahmoud Abbas and UN Secretary-General Ban Ki-moon on Sunday, which will look to try and push for an end to fighting in the Gaza strip, according to a senior source from the country. The session is due to take place in Doha and will be chaired by the Gulf state's emir, Sheikh Tamim bin Hamad al-Thani, who has been acting as a "channel of communication" between the Islamist Hamas group and the international community, said the source. "Qatar has presented Hamas' demands to the international community. The list has been presented to France and to the UN. The talks tomorrow will be to further negotiate these conditions." Hamas, which controls the Gaza Strip, has rejected Egyptian efforts to end the fighting, saying any deal must include an end to a blockade of the coastal area and a recommitment to a ceasefire reached in an eight-day war there in 2012. The conditions include the release of prisoners re-arrested since a 2011 exchange deal with Israel, the opening of Gaza-Israel border crossings and an end to an Israeli blockade on the Gaza seaport, a Hamas source in Doha said. "In general, Israel must end all forms of aggression and attacks, end the blockade of Gaza and remove the actions that resulted from its military offensive in the West Bank after June 12," Hamas spokesman Sami Abu Zuhri told Reuters in the Palestinian Territories. Egypt said on Saturday it had no plans to revise its ceasefire proposal, which Hamas has already rejected. And the Hamas source in Doha said the group has no plans to change its conditions for a ceasefire. "We want the rights of our people. Palestinians on the ground are supporting us and we will get them back their rights," said the source. An IDF spokesman insisted to RT that Israel does not target civilians. “We do not target in any way or form civilians, we target Hamas terrorists. The idea of the operation is ongoing in order to secure safety and security for the state of Israel. Hamas decided to have an onslaught against the state of Israel and indeed even when we held our stations yesterday for six hours they continued to bombard Israel indiscriminately and we were left basically with no alternative,” he said.